Helicopters and their electronics have improved in both design and performance, allowing us to perform 3D maneuvers never before thought possible. Although I’m continually amazed at the new pilots and their innovative maneuvers, one of my favorites is still the old-fashioned autorotation landing. I like this maneuver for several reasons. First, each and every one is different than what has gone before. The starting point is a little different, or the wind has changed, or the flight path to landing is never exactly the same. And all is these variables require the pilot to make minor, but immediate, adjustments to the helicopter while it’s descending. Although all of our modern helicopters are capable of performing autos, some are better suited than others for the job. As a general rule, larger helicopters are easier to auto than the smaller ones because they have a larger rotor disk to provide greater lift and they have heavier rotor blades that can store the kinetic energy needed during the flare and landing. So if you have the opportunity to practice autos with a larger helicopter, it will make the maneuver a lot easier than with a smaller one. Another factor in your helicopter’s ability to perform an auto is its weight. Heavier helicopters descend more quickly to maintain rotor speed and also use up more of this stored energy during the flare and landing. However, this is becoming less of a problem with newer design helicopters because they use more carbon-fiber and CNC-machined aluminum parts to keep weight to an absolute minimum. Throttle-hold basics The throttle hold function on your helicopter transmitter is used to practice autos, and how you set up your helicopter in this mode has a lot to do with the helicopter’s ability to successfully perform an auto. Although autos are usually performed with the engine set to a low, reliable idle, this is not a good throttle setting for initial practice. The most critical part of the maneuver is during the flare and landing, and any mistakes this close to the ground can be catastrophic. To provide a little margin for safety I recommend you increase the throttle-hold idle speed to something just below that which is required to hover the helicopter. This will guarantee you plenty of rotor speed during the flare and landing. When you feel more comfortable, you can decrease the engine speed little by little until you are at a full idle condition. Your radio also has a separate pitch curve for throttle hold, and it’s important to have both the minimum and maximum pitch set for optimum performance. 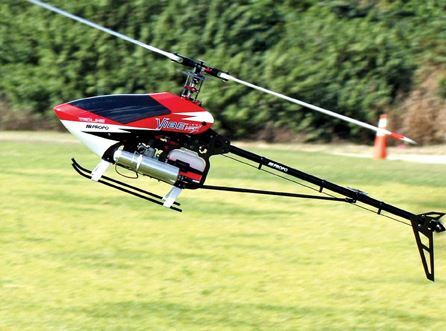 During the descent, the pitch must be held slightly negative so the air coming up through the rotor disk will maintain adequate rotor speed for maneuvering and landing. However, to keep from overshooting the landing zone, it’s important to have a little extra negative pitch available, so I generally set my minimum pitch to about -5 degrees. This allows me to play the negative pitch during descent to both maintain rotor speed and adjust my glide path as needed. As for setting the high pitch, most rotor blades stall in the 15-degree range, which is also where they provide the maximum lift, so this is a good place to set your full collective pitch. Now that you have your throttle hold and pitch curves set to practice autos most pilots are anxious to start practicing to see how well they can perform this maneuver. However, how successful you are in performing this maneuver depends largely on how well you set it up and make your initial descent. Because the helicopter will be quite high in the sky as you start, pick a day where you can keep the sun to your back while landing into the wind and make a few “dry runs” in your mind. Imagine your helicopter where you would like to see it at the entry point to the maneuver. Now practice lowering the throttle and activating the throttle hold, and imagine the helicopter coming down this imaginary glide path, all the way to the flare and touchdown. Try this for several approaches to get used to using the throttle in connection with the hold switch, and then imagine having to go around for some reason by getting out of throttle hold, adding the power and transitioning back to level flight. This will get you into the mindset that you don’t have to complete the landing of every approach. If the approach doesn’t look right for some reason, simple switch out of the throttle hold mode, fly out of the descent and try another approach. After several of these imaginary approaches, and go-arounds, you should be ready to try the real thing. With your helicopter in the same entry point you just practiced in your mind, lower the throttle (but do not activate the throttle hold switch) and try a short approach to an intentional go-around. See how easy it is to abandon an approach if needed, and how you would transition into level flight again. Now try it again, but this time activating the throttle-hold switch. After a slight descent, turn off the throttle hold and again transition back to level flight. This will give you good practice with the throttle hold switch, and practicing go-arounds if needed. Once you feel comfortable with these practice approaches and go-arounds, it’s time to try the real thing. Aim for a consistent glide path, with a good flare and soft landing. As you become more comfortable with these approaches, gradually lower the engine idle speed until you can make a safe and controlled landing with the engine at full idle. A helicopter transmitter has no shortage of knobs and switches, and this can be a little confusing during a flight. However, a small piece of fuel tubing over the throttle hold switch makes it easy to find when needed.